Nice, quiet, and comfortable. Wasn’t crowded for a Saturday night stay. The holel is pretty close to my several customers. I will use this holel whenever I come to this area. The one thing that I have in touble is that I could not find plug to connect PC, mobile tool, and Iphone. I want some extra plugs in room and they should be found easily near desk. So you're kicking around the idea of a trip to Pell City? If you want a place to call home that's located close to Pell City attractions, use Orbitz to pick your travel dates, and then presto! Look through the list of hotels and other accommodations to find those that are close to what you want to see while you're in the area. 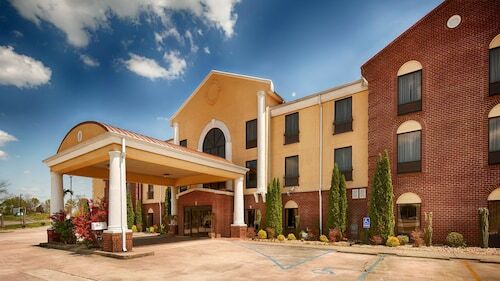 You might not find the perfect place to stay in the heart of Pell City, but you can pick from 47 accommodations within the larger area. Search by filters such as price, neighborhood, guest rating, or popular locations, depending on what's most important to you. We make it easy to find a convenient flight into Birmingham, AL (BHM-Birmingham Intl. ), which is 27 mi (43.4 km) from the heart of the city. Find your ideal flight in a flash by using the filters on our site to narrow down your search. Go for a swim when you stay at one of these Pell City properties, noted for their pools. What's the Weather Like in Pell City? Chastity at the front desk went above and beyond. She was very friendly and helpful. An excellent employee and a real asset to your hotel.